Parking space is provided for students on the east and west sides of the campus. A parking registration bumper/window sticker must be displayed on the rearview mirror. Tags are available in the Bookstore and the cost is included in the student activity fee. All tags are valid for the school year beginning July 1 and ending on June 30. Visitors to the campus must first go to the Administration Office (Building #1) to sign the guest register and receive a visitor’s badge. Visitors are not permitted in classrooms without prior approval. Try carpooling, taking the bus, riding the train and the SFEC shuttle, biking, or walking to school! South Florida Commuter Services can help you find a carpool partner, provide you information on Broward County Transit, Tri-Rail, and the FREE SFEC Shuttle, and also help you bike or walk more safely to school. Click here for more details. 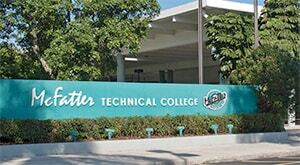 To ensure maximum safety and security, McFatter Technical College employs a Security Specialist and a Davie Police Officer who patrols the campus during class hours, day and evening. Cameras positioned around the campus provide 24 -hour surveillance. Facilities for students who become ill are located in the Medical Building. Each laboratory / shop has emergency first aid supplies. Parking is available on the east and west side of the campus. Visitors are welcome to park in any space except those designated for staff or handicapped. Visitors are asked to sign in at the reception desk in Administration Building 1. Parking space is provided for students on the east and west sides of the campus. A parking registration bumper/window sticker must be obtained and displayed. Tags are available in the bookstore and the cost is included in the student activity fee. All tags are valid for the school year beginning July 1 and ending on June 30. Designated “No Parking”, “Staff Only” and fire lane areas must be observed and will be enforced by school security.